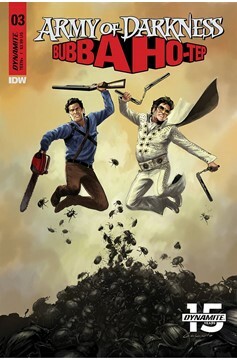 Having just scored a victory against the nefarious Bubba Ho-Tep, our heroes Ash and 70's-era Elvis take to the skies in the King's private jet, escorting the powerfully destructive Necronomicon Ho-Tep. In order to keep it out of the wrong hands, they must provide the Egyptian artifact safe passage back to Elvis' secure fortress in Graceland. But even at 20,000 feet, evil lurks closer than they realize…as do giant scarabs! It's the penultimate chapter of the year's most groovy crossover event!.